Waxing is a quick, gentle and long lasting way to define the shape of your eyebrows. A treatment offered by most beauty salons on a pre-booked appointment or by brow bars on a ‘walk-in’ basis. Plucking out individual hairs takes much longer and you run the risk of getting carried away with the tweezers, and ending up with bald patchy or in a continual process of trying to remove stray hairs, especially any fluffy ones. 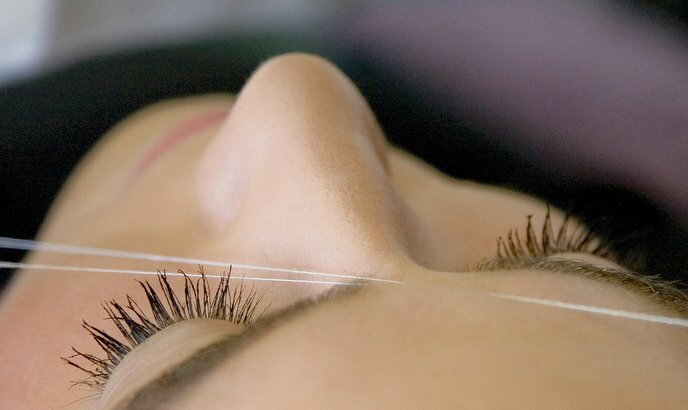 Threading, whilst precise and increasingly popular, tends to hurt more than waxing and takes a little longer. This eastern approach is more likely to be available in brow bars or specialist stands, rather than in traditional beauty parlours. Having your eyebrows waxed takes only a handful of minutes and can cost as little as €8. Regrowth takes several weeks and hair becomes lighter, thinner and weaker with multiple treatments. Well-groomed brows frame the face and accentuate your features. It’s best to let a professional create the shape, even if you then maintain this at home. Before attending your appointment you’ll want to grow out your brows, for as long as you’re able to bear it, so that their natural shape is visible. Both dark and lighter fluffy hairs are removed in one go, using small strips and hot wax applied with a slim spatula or an applicator with a roller ball. The beautician will ensure that your brows are symmetrical and draw an imaginary line from the end of the nose to the inner and outer edge of the eye to use as a guide. Hair is mainly removed from in between and underneath your eyebrows. Your brows might also be trimmed from above to create a sharper outline. At the end of your treatment a soothing gel will be applied to cool and reduce any redness. You’ll be offered a mirror to check the results and can always ask for your brow length to be shortened or the arch to be made sharper if you’re not happy with the shape. Whatever you do, don’t be tempted to overdo it or you’ll end up with a permanently surprised look. A trained beautician won’t let you anyway and hair does usually grow back if left unattended. Well-groomed brows frame the face and accentuate your features. It’s best to let a professional create the shape, even if you then maintain this at home. Once your unruly eyebrows have been tamed you might want to consider other enhancements. You can have your brows and lashes tinted to draw attention to the eyes and add semi-permanent texture or use mascara and an eyebrow pen/ pencil to create the effect at home. Extensions are another way to add density to eyebrows, as you would with eyelashes. Individual fibres are stuck on in a time-consuming treatment which helps cover up any gaps whilst your own hair grows back. There are longer term programs which aim to thicken, darken and add volume to eyebrows over time such as High Definition (HD) Brows and Benito Brow Bar’s Back to WOW Bootcamp which has taken the north of England by storm. Other specialist eyebrow brands that you might come across include Blink, the original walk-in brow bar, found in Harvey Nicholls, John Lewis, Selfridges and Get Lashed, the sister brand of Nails Inc. found in Debenhams. Whichever eyebrow shaping treatment you decide on, Treatwell can help you find your nearest salon and an appointment for waxing, threading or plucking at a time to suit you.